Cheadle plays piano, saxophone and drums but took up the trumpet so that he could appear authentic on camera. While he does play in the film, the sound is actually looped with the real music from Davis. The film was not easy to finance. Cheadle ran an Indiegogo campaign to raise money. He also said that he had to cast a bankable white actor to get the film made. That actor, Ewan McGregor, plays a journalist who becomes a kind of confidant and running buddy of Davis. Miles Ahead takes place in the 1970s, during a time when Davis’ drug addiction kept him from playing the trumpet, but the film also shifts back to earlier years and his relationship with Frances. The film is a bit like the jazz musician’s music; it moves fast at times, and that might not be what everyone wants. 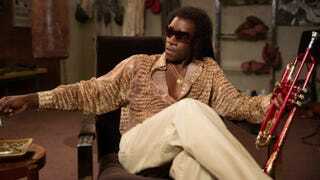 But Cheadle fully captures Davis, with a raspy voice, Jheri curl wig and ability to pull off playing the trumpet. Miles Ahead opens April 1.